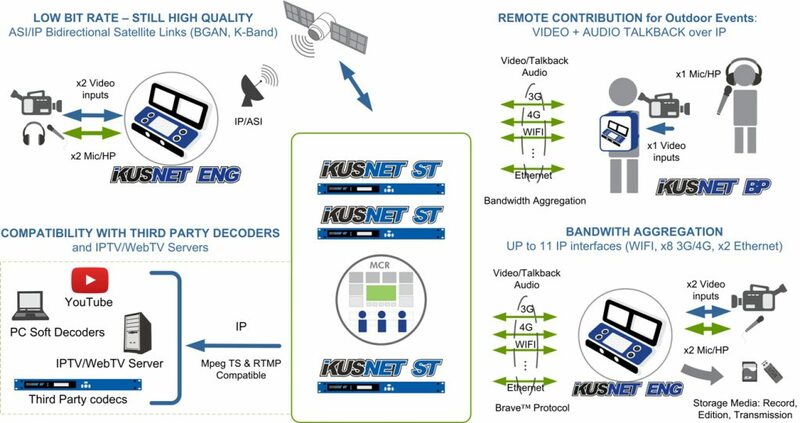 Ikusnet ST is a rack mounting unit that encodes and decodes H.264 video. It supports a separate bidirectional audio stream as a coordination/talkback channel to send and receive voice instructions to and from the field unit, at the same time it is able to send and receive the main video and audio program feed. Ikusnet ST supports file recording on an optional internal hard disk or an external storage device (USB). Files can be moved between two Ikusnet codecs or can be uploaded to an FTP server. 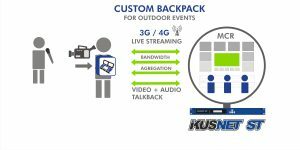 When sending files to Ikusnet ST, the portable unit implements bandwidth aggregation using all of the available IP links on the unit to make file transfer much faster and reliable. 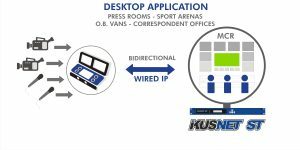 Ikusnet ST has been designed to be as easy to use as possible and can be operated either from the front panel menu or built-in web interface. A portable Ikusnet can be controlled remotely from the Ikusnet ST web control to which is connected. Comprehensive definable presets allow the unit to be setup in advance, so that non-technical users can accomplish live broadcasts quickly and easily. Bidirectional live video + talkback audio streams. Mpeg4 AVC/H.264 HD/SD Live video broadcasting over IP and Satellite. Live Recording and fast FTP file upload. Multiple transmission protocols: BRAVE™ (BitRate Adaptive Video Encoding), MPEG-TS and RTMP. 2 x Interfaces Ethernet con posibilidad de agregación de ancho de banda (bonding). Permits the assembling of up to 10 incoming sub-streams and its restreaming to other MPEG-TS and/or RTMP compatible codecs. Compresión y streaming de hasta 4 canales de audio embebido de la señal SDI. Compression and streaming of up to 4 SDI embedded audio channels. NAT Traversal Remote control via web interface of a portable Ikusnet from Ikusnet ST. File storage using internal HD or external USB memory. 1080i to 720p and 576/480i to 576/480p deinterlacer included. 2 x RJ-45 Fast Ethernet ports to split data and control or for bandwidth aggregation. Auxiliary storage via internal Hard Disk or USB device. Simultaneous recording during live reception. BRAVE™ (BitRate Adaptive Video Encoding), MPEG-TS and RTMP protocols for audio and video reception and re-streaming over IP. FEC, Error Concealment and Active Packet Recovery to mitigate network impairments. Configurable transmission delay to adapt to different network types and performances. Real time Network Monitoring Tools and statistics. 3 x USB 2.0 connectors for peripherals. NAT Traversal Remote Control via Web interface of Ikusnet Portable from Ikusnet ST.
Transparent auxiliary data transmission on serial port and GPIO functions. 2 video outputs for Program. H.264 standard encoding with selectable bitrates starting at low bit rates. 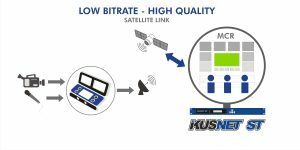 Selectable or automatic bitrate to optimize transmission quality network conditions. Factory and custom encoding presets for fast operation. 1080i to720p and 576/480i to 576/480p deinterlacer. 2 audio channels: Program and Talkback. Compression and streaming over IP of up to 4 SDI embedded audio channels. AAC and HE AAC encoding algorithms. AAC ELD encoding in the talkback channel.